Introducing Superman Mr. Potato Head and Wonder Woman Mrs. Potato Head! Let’s face it, Mr. and Mrs. Potato Head are the original cosplayers. So it’s fitting that they’ll soon be suiting up as two of the most universally recognized DC super heroes: Superman and Wonder Woman! He may be made of plastic, but this summer Mr. 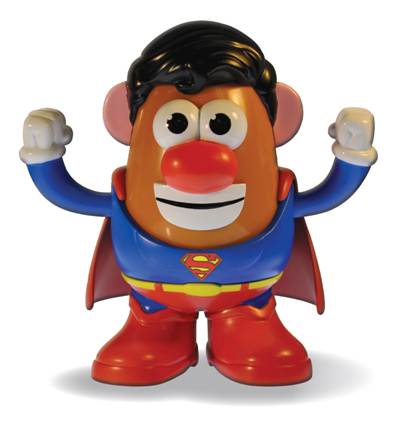 Potato Head will be dressed as the Man of Steel, complete with his classic costume and cape. Meanwhile, Mrs. Potato Head pays homage to Wonder Woman, wearing her tiara, bracelets and lasso of truth. Each figure stands 6” tall, and is perfectly built for play or display…or both! Enjoy this exclusive first look at Wonder Woman Mrs. Potato Head, presented below along with her super companion, and look for both Potato Head figures in specialty and collectible stores and websites this August!